The king of the dinosaurs, T-Rex (Tyrannosaurus Rex, meaning “Terrible King”) is probably the most widely known of all of them. 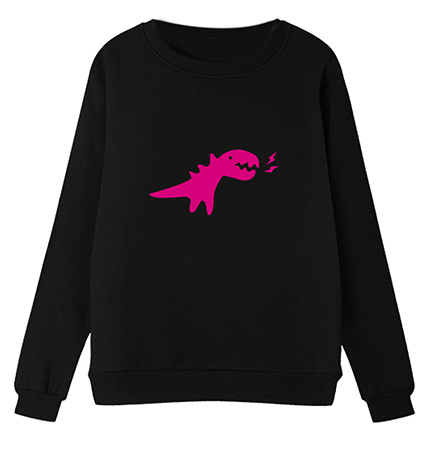 This fun black sweatshirt has a wide crew neck opening with rib knit trim, long sleeves ending at the wrist, also with rib knit trim, and a zany hot fuchsia T-Rex silhouette transfer on the chest. Falling to just below the natural waist, this black sweatshirt also boasts rib knit trim matching that found at the neck and cuffs. Soft cotton “Dina” poly blend sweatshirt knit is smooth on the outside but oh so fuzzy and soft inside!